Ancient Harvest Quinoa, of course! I saw the ingredients and immediately thought, "PIE!!" 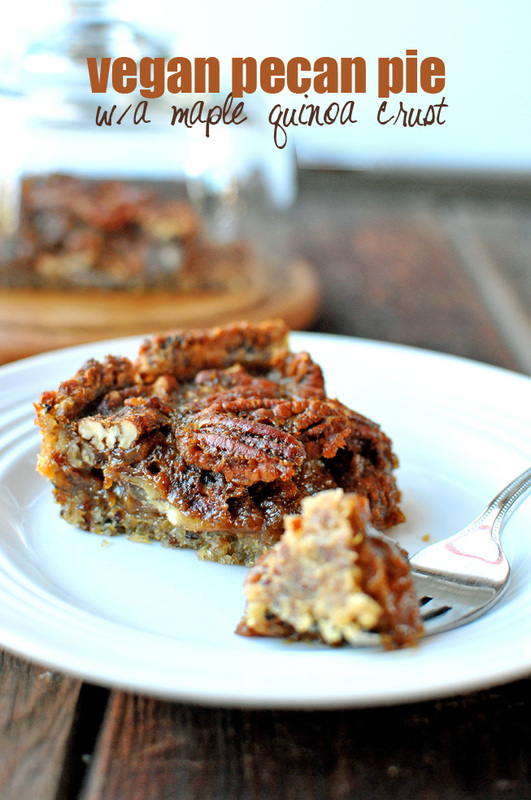 I have always wanted to create a healthier pecan pie that had the same flavors and texture as the original, but without any corn syrup. So that's what I did! Let's talk about this maple quinoa crust. It's delicious and so simple to make!! There's only 5 ingredients: cooked Ancient Harvest quinoa, brown rice flour, ground flax, butter, and maple syrup. It has structure and integrity as a crust, a sweet buttery flavor, and is the perfect backdrop to this pecan pie. And it's packed with protein, thanks to the quinoa! 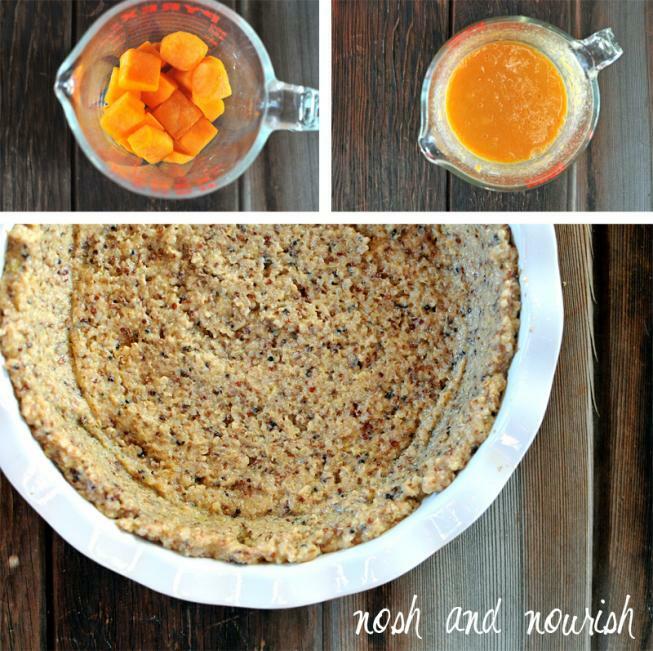 The pureed butternut squash and vanilla almond milk act as a thickener in place of the corn syrup. 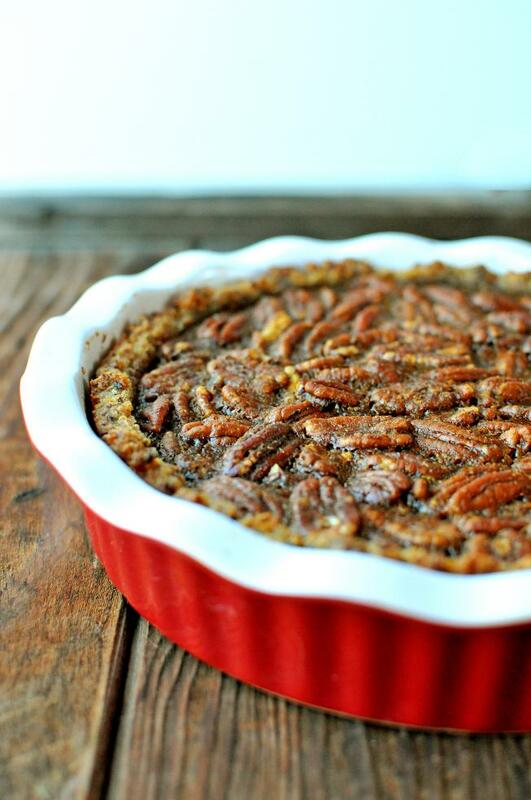 It's a beautiful, decadent, and mouth-wateringly good pecan pie, that you can actually feel good about eating. It really could not have turned out more perfectly!! Amazing. Delicious. Rich. Vegan. Speaking of, I'd really love another slice right about now! 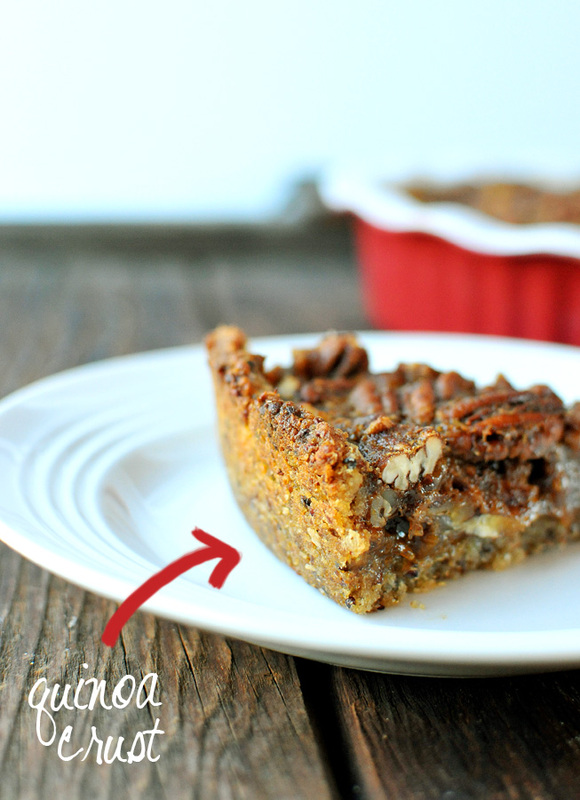 *You can always bake this in a regular pie crust -- and just follow the instructions for the filling for the pecan pie. Up to you! Prepare your flax eggs -- mix 3 Tbsp flax with 9 Tbsp warm water. Refrigerate for at least 15 minutes. Combine crust ingredients. Bake for 12 minutes, then take out of oven until pie filling is ready. In a medium saucepan, combine ingredients (butter through cornstarch) over low heat, stirring frequently. It will thicken up over 10 minutes or so while the crust is pre-baking. Cook your butternut squash -- I microwaved mine covered with 1/2 cup of water for 4 minutes on High. Then, drain the water...and add in the almond milk. Use an immersion stick blender to puree. Add butternut squash/almond milk mixture to the syrup-y mixture on the stovetop as well as the flax eggs made in step 2. Then, stir in pecans. Pour into the partially-baked pie crust, and then bake entire pie for 60 minutes. Let cool for an hour before slicing.